Wow... I can't believe it's been over a month since I last posted. Certainly I've been busy, but I always like to regroup and fill people in on what I've been doing between updates. I'm re-joining Running Storm Productions again to perform in their 48HFP that shoots this weekend! Dean first cast me as the lead in his short for the inaugural 29 Days Later Project, which he also co-founded. I then worked with him again on the "Crash the Superbowl" Doritos Commercial Contest which we shot in fall 2010. I'm excited to see everyone again and work together on what's sure to be a fun project all around. Tickets should be available via the Charles Theatre website probably starting next week. Later this month I'm meeting with Charles Martin Kline of The Mystery Workshop to discuss my involvement with a horror film he's working on this summer. My involvement would include assisting with makeup and special effects as well as possibly doing some puppeteering on certain effects and monsters in the film! All details should be hammered out for the end of the month so I'll have a better idea of what to expect, but man... I have to say I've always been a huge fan of horror effects (particularly animatronics and stop-motion effects featured in so many early 80s horror films), so this project should be pretty cool to be involved in! I've hit up a few different auditions this month and last, and I'm in the running for a creepy-evil ghost role in a short called "The Dark," so we'll see what comes of that. Otherwise, I did Stonehenge this past Sunday and had the opportunity to audition for the Maryland Ensemble Theatre's mainstage season, which consists of an adaptation of "A Clockwork Orange," which I am utterly speechless over. I will be seeing it regardless! I read the book and watched the movie endlessly when I was in high school, so I'm really interested to see it interpreted onstage. 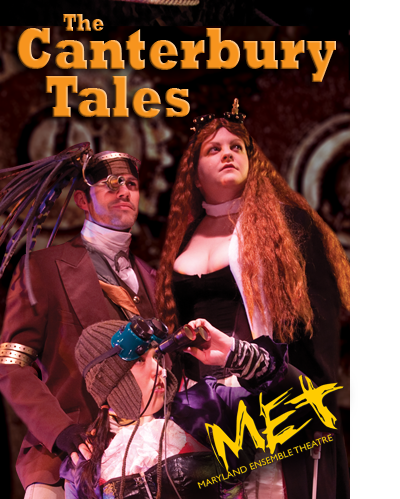 In addition to attending the MET's auditions, I have been looking over lines for their steampunk adaptation of "The Canterbury Tales," for a potential fall tour of the show. I saw the production earlier this spring and was approached by writer-adapter Reiner Prochaska to perform in it. Again, an exciting opportunity to work on a very cool, stylized vision. This is the kind of work I really am drawn to. With all these adaptations I've heard of/seen in the past few months, I've been kicking around an adaptation idea in my brain a bit and perhaps with a few more conversations and planning, I may be interested in putting up a production for next summer's Capital Fringe Fest. It's just an iron in the fire for now, but the past week has got me very seriously considering it as a real possibility.